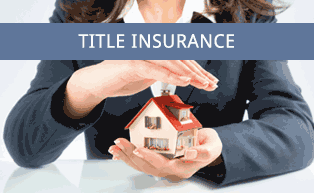 Why is Title Insurance Right For You? Title clearance and policy issuance across the U.S Americans have the future in mind when they buy a house, and they purchase homeowner’s insurance to help protect that future. But with home ownership comes the need to protect the property against the past, as well as the future. Each successive owner brings the possibility of title challenges to the property. Title insurance protects a policyholder against challenges to rightful ownership of real property, challenges that arise from circumstances of past ownership. When you purchase real property, rely on Fidelity National Title to protect your interests. You’ll be insured by the leading title company in the U.S., backed by more than 160 years of successful title operations. Real estate has traditionally been a family’s most valuable asset. It is a form of wealth that is protected by many laws. These laws have been enacted to protect one’s ownership of real estate and the improvements ... located on the land. The owner, the owner’s family, and the owner’s heirs have rights or claims in and to the property that you are buying. Those who may have an interest in or lien upon the property could be governmental bodies, contractors, lenders, judgment creditors, the Internal Revenue Service, or various other individuals or corporations. The real estate may be sold to you without the knowledge of the party having a right or claim in and to the property. In addition, you may purchase the real estate without having any knowledge of these rights or claims. In either event, these rights or claims remain attached to the title to the property that you are buying until they are extinguished. Generally, a person thinks of insurance in terms of the payment of future loss due to the occurrence of some future event. For instance, a party obtains automobile insurance in order to pay for future loss occasioned by a future “fender bender” or for the future theft of the car. Title insurance is a unique form of insurance. It provides coverage for future claims or future losses due to title defects which are created by some past event (i.e., event prior to the acquisition of the property.) These risks are far less obvious than those protected against by automobile insurance, but can be just as devastating. Title insurance gives you the assurance that possible clouds on title to the property you are purchasing - which can be discovered from the public records - have been called to your attention that such defects can be corrected before you buy. Additionally, it is insurance that if any undiscovered claims covered by your policy arise out of the past to threaten your ownership of real estate, it will be disposed of, or you will be reimbursed exactly as your title insurance policy provides. Every owner, purchaser and beneficiary, whether by a deed or contract, should have an insured title. The entire investment depends upon the quality of title. If you are buying real estate mortgages, you are paying for a good title and you should see that you have one. If either fire insurance or title insurance is omitted, your security is not complete. Our title policy protects you against unforeseen defects in title that would not be revealed by an abstract, the public records or an attorney’s opinion. Whether this is your first home or fiftieth real estate investment, ask your REALTOR® or broker to protect you and your property with Fidelity National Title.